She has earned worldwide admiration and woos the crowds. The gentleness of her character overshadows her size and strength. Though she is unable to speak, her large, soulful eyes speak unconditional acceptance and forgiveness. Yet, one can look deeper into those eyes and see a sense of longing. Is she hiding sadness or anger? Or is she truly content? Mabel is a circus elephant. 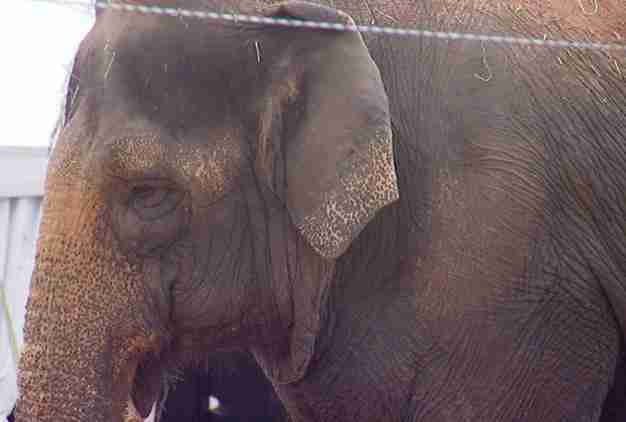 She is one of dozens of Asian elephants traveling and performing with the Ringling Bros. and Barnum & Bailey circus. The Ringling Bros. brand, now owned and run by Feld Entertainment, has entertained audiences worldwide since the late 1800s. Wild animal acts have always been a huge part of its audience draw, and the elephants have become synonymous with its image. But times have changed, and changing times have brought up questions regarding animal captivity within public and private sectors over the past 30 years. Zoos and circuses have come under fire for using wild animals as a source of entertainment and profit by animal rights watchdog organizations such as People for the Ethical Treatment of Animals (PETA), Mercy for Animals, the ASPCA, The Humane Society of the United States, and North Carolina's Speak Out for Circus Animals. Under the federal Animal Welfare Act, zoos and circuses are required to be licensed and monitored by the United States Department of Agriculture. The AWA regulates and sets guidelines for housing, transportation and care of animals. Zoos and circuses are also subject to state and local animal welfare laws and permit requirements, to provide protection for the animals and allow for prosecution of those who neglect or mistreat animals in their care. But even though wild animals, especially elephants, fall under a federal protection umbrella, a shift in public and expert awareness of the mighty elephant raises a crucial ethical question: Are they even ours to use and exploit in the first place? According to Ringling Bros., "Studies have shown that the public display of performing elephants contributes to heightened public awareness of the animals themselves and of our responsibility for their well-being and protection. "This is especially true for children, who not only become more aware of elephants and their special needs and abilities, but also experience firsthand the importance of caring for and respecting all animals." However, Feld Entertainment has been cited by the USDA for failure to comply with humane treatment laws over 70 times since 1993. In late 2011, the corporation was ordered to pay $270,000 in fines by the USDA - the largest civil penalty ever assessed against an exhibitor under the AWA. 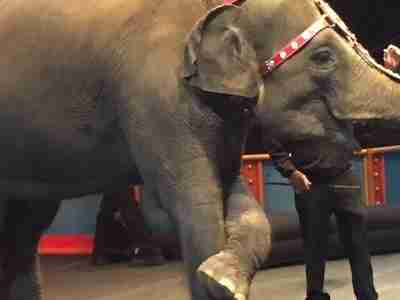 In 2009, PETA recorded Ringling Bros. employees undercover for months in numerous U.S. states. Videotape and photos revealed repeated abuse and violence toward elephants, both backstage and at Ringling's Florida training center. Undercover footage from the investigation was published by PETA. Ringling Bros. published a formal response to the PETA allegations on its website, claiming that while the footage appeared disturbing, it was also questionable. In October 2012, the USDA opened a formal investigation into Ringling Bros. for violations of the AWA. Its most recent citation occurred in December 2014, for failure to maintain an adequate program of veterinary care for three elephants. One of the claims made by Ringling Bros. on its website is that it has not violated any laws. "In more than 40 years of current ownership, Ringling Bros. has never been found in violation of the AWA for abuse, neglect or mistreatment of its animals," Ringling says, adding, "In fact, in all aspects of animal care and safety, Ringling Bros. meets or exceeds all federal animal welfare standards." In 2014, Feld Entertainment won $25.2 million in settlements from a number of animal rights groups, including the Humane Society of the United States, ending a 14-year legal battle over unproven allegations that Ringling circus employees mistreated elephants. Elephants are the largest land mammals living on earth. They also have the largest brains of any land mammals, including humans, with their brains having more complex folds than all animals except whales. What makes an elephant's brain extraordinary is that the hippocampus - the region of the brain responsible for emotion and spatial awareness - is more developed than any other animal's. Because of that heightened intelligence and awareness, elephants show definitive emotions of grief, humor and compassion, and social skills of cooperation, self-awareness and playfulness. They are known for grieving for their dead by paying homage to the fallen, making sure that all herd members have paid respect before moving on. Elephant herds are matriarchal, run by the females, and very closely knit. So close, in fact, that a female elephant will only leave her herd if she dies or is captured. With all those characteristics in mind, the practice of capturing and confining elephants to small spaces becomes an issue. One well-recognized sign of profound deprivation and intense confinement in animals is a condition known as "zoochosis," a mental condition causing repetitive, abnormal behaviors. Elephants held in confinement often tend to exhibit zoochotic behavior either by swaying back and forth or pacing in circles. They are creatures designed to move in herds on a daily basis, traveling hundreds of miles, so the sentence of confinement takes its toll on them just as it would humans. The International Union for Conservation of Nature (IUCN), the world's oldest and largest global environmental organization supporting scientific research, managing field projects, and developing policies and laws, takes a differing view on elephant captivity. Its Species Survival Commission African Elephant Specialist Group (AfESG) expresses its view in a written formal statement on the IUCN website: "The AfESG is concerned by the poor breeding success and low life expectancy of captive African elephants and does not see any contribution to the effective conservation of the species through captive breeding per se." The group also decided that there should be no formal linkages between the AfESG and the Association of Zoos and Aquariums (AZA), but there could be continued dialogue regarding prioritization of their input into field research and conservation programs in the field. Organizations like IUCN helped to initiate and are now raising awareness on a growing worldwide trend - moving away from the captivity of elephants and moving toward conservation efforts. Both Asian and African elephant populations are now at critical numbers, due to threats such as poaching, hunting, captivity and entertainment industries. To help protect the Asian elephant's present and future well-being, Ringling Bros. established its Center for Elephant Conservation in 1995. This 200-acre facility, located in central Florida, is dedicated to the conservation and breeding of Asian elephants. Just as on the issues of animal captivity and entertainment, there are also two opinion camps on conservation facilities and breeding in captivity. Some believe it is a lifeline to save the species, while others believe it is interfering with the natural course of life and could be detrimental. But Ringling Bros. stands by its purpose and mission. Dr. Dennis Schmitt, Chair of Veterinary Services and Director of Research with the animal stewardship department at Ringling Bros., developed the first elephant from artificial insemination in 1999. He is considered the leading North American expert in elephant reproductive physiology and veterinary management. He is also a member of the IUCN's Asian Elephant Specialist Group. The Center for Elephant Conservation has seen 26 elephant calves born since its establishment. Another U.S. conservation program, one to save African elephants, is located about 500 miles north of the Ringling center. The North Carolina Zoo in Asheboro, N.C. is following the trend of similar worldwide efforts to intercede for the animals. The zoo has been working to help solve elephant conservation problems in the central African country of Cameroon for 15 years. Dr. Mike Loomis, Chief Veterinarian, is in collaboration with the World Wildlife Fund to use satellite tracking technology to monitor the movements of elephants at several sites across Cameroon. Satellite tracking collars are placed on the elephants to identify important habitat areas for protection and intervene before the elephants reach farmlands, where conflicts often occur with humans. Guy Lichty is one of two mammal curators at the zoo and involved in the care of elephants. He says there have not been any calves born at the zoo yet, but it is in future plans. "We designed our expansion to hold up to two full-grown males, 3 or 4 cows and their offspring, for a total of up to 10 or 11 elephants, depending on age," Lichty says. He also says elephants have been imported from other facilities before, in order to build a multi-generational breeding herd. Worldwide efforts to save elephants from extinction and raise public awareness on captivity issues are evidence of a turning tide. The turn may be gradual, but momentum continues to move forward. In a recent bold move, Ringling Bros. took a giant leap forward that may be a game changer within the industry. On March 5, 2015, Ringling announced it will eliminate all its elephant acts by 2018, amid public concerns over animal mistreatment. Feld Entertainment executives said the decision to end its elephant tradition was a difficult one to make. Alana Feld, the company's executive vice president, said, "There's been somewhat of a mood shift among our consumers. A lot of people aren't comfortable with us touring with our elephants." The company owns 43 elephants, the largest herd of Asian elephants in North America. Twenty-nine of them live at the Center for Elephant Conservation. 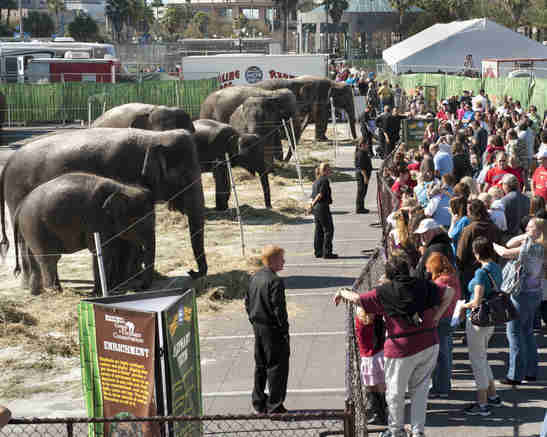 Thirteen animals will continue to tour with the circus before retiring to the center by 2018. 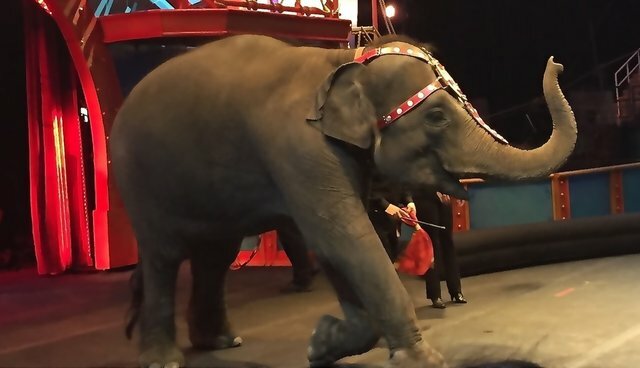 Another reason for the decision, according to President Kenneth Feld, is that certain cities and counties have passed "anti-circus" and "anti-elephant" ordinances. He said it costs about $65,000 a year to care for each elephant, and it's expensive to fight legislation in each jurisdiction. "All of the resources used to fight these things can be put toward the elephants," Feld said. "We're not reacting to our critics; we're creating the greatest resource for the preservation of the Asian elephant." That decision is one that many have fought for. Ingrid E. Newkirk, president of PETA, wrote in a statement, "For 35 years PETA has protested Ringling Bros.' cruelty to elephants. We know extreme abuse to these majestic animals occurs every single day, so if Ringling is really telling the truth about ending this horror, it will be a day to pop the champagne corks, and rejoice. If the decision is serious, then the circus needs to do it NOW." Almost 30 countries have either banned the use of wild and exotic animals in traveling circuses altogether or have established regional ordinances. Twenty states within the U.S. now have local ordinances in place, yet many think the issue should be addressed at a federal level. Mabel the circus elephant probably feels the same way. She's waited a very long time. A brief look into the circus industry and methods used in the captivity and training of circus animals. 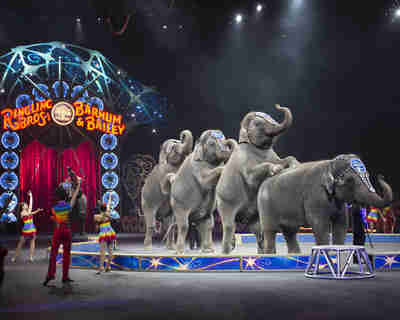 Asian elephants perform at the circus / PHOTO CREDIT: Ringling Bros.